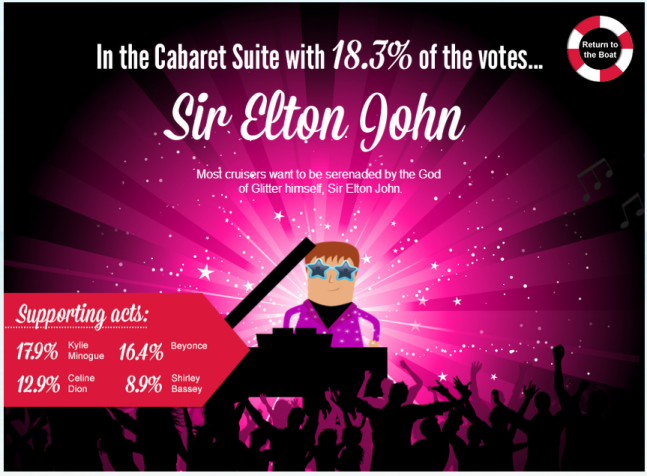 Elton John tops the list of entertainers to share a cruise with. You’re wearing your finest cruise duds and have struck a pose for the adoring paparazzi (really the cruise cameraman). Will your picture hit the headlines in its full glory the next day? As you walk up the red carpet to board the ship, to your delight you discover some of your favorite celebs are also onboard. 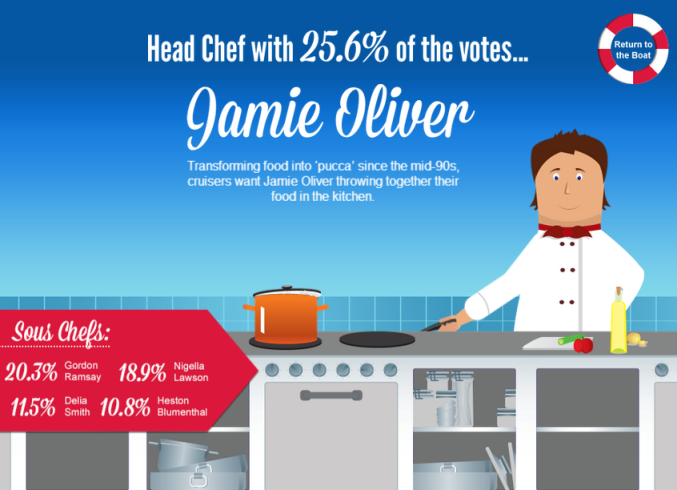 What would you like chef Jamie Oliver to prepare for you? Who did you picture waiting to greet you into their inner circle? Is there a star singer planning to entertain you, sports personality offering to challenge your skills, or a chef looking to create a whole new meal inspired by your excellent tastes? British travel company, Virgin Holidays Cruises, has conducted a survey to find out who their countrymenwould most like to share their cruise with. Many Americans would likely agree with their counterparts from across the ocean. 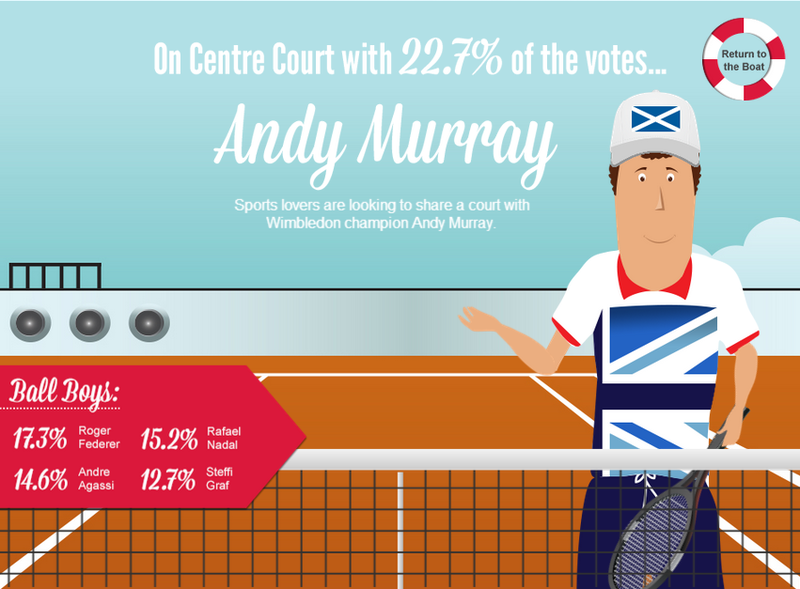 Check out these graphics to see if your favorite celebrities were included. 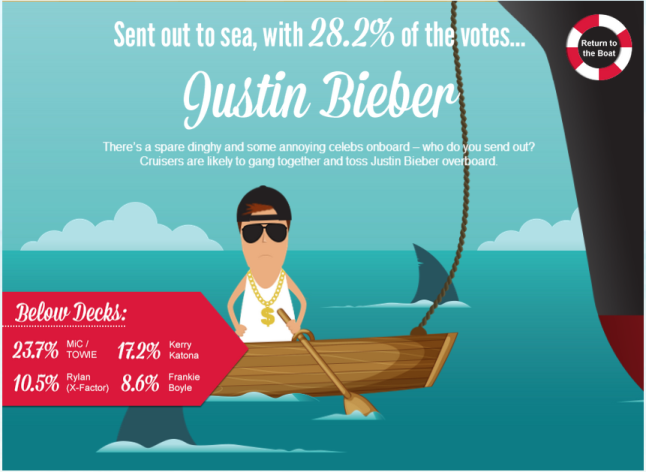 Cruise goers prefer to leave Justin Bieber at home...enough said. Virgin Holidays Cruises works with all the major cruise lines including Carnival, Celebrity, Disney, Holland America, Norwegian, Star Clippers, Princess, Royal Caribbean, Fred Olsen, and others. They can help plan your vacation to the Caribbean, Mediterranean, Far East, or Alaska. This article was supported and photos were provided by Virgin Holidays Cruises.